We come to this year’s commemoration of Rev. Dr. Martin Luther King, Jr. a nation divided, disturbed and distrusting. While children of all races play together, work together and create families together to a degree Dr. King would likely find surprising, we are not exactly living the “Dream.” We are not getting along. Oh, we’re communicating with each other all the time, Dr. King. Get a load of this thing we call Twitter. Then there’s Facebook, Instagram, text messaging, YouTube. The president gets on TV or a singer gets on stage and we are bloviating in real time about it with people all over the globe. Of course that’s not the communication King was talking about. Dr. King might respect the technology, but he would not be impressed with its use. Our technology has raced ahead of our ticker. 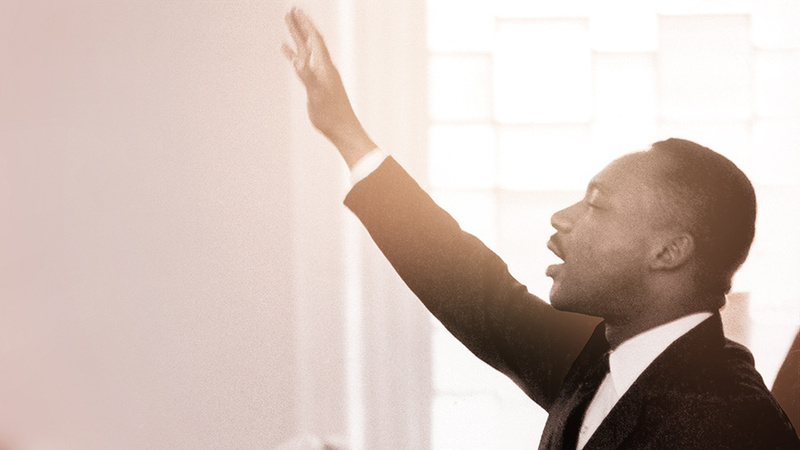 In a 1956 sermon called “Paul’s Letter to American Christians,” Dr. King re-imagined Paul’s letter to Romans as talking to the Americans of the mid 20th Century. He is talking to us today. America, as I look at you from afar, I wonder whether your moral and spiritual progress has been commensurate with your scientific progress. It seems to me that your moral progress lags behind your scientific progress. Your poet Thoreau used to talk about “improved means to an unimproved end.” How often this is true. You have allowed the material means by which you live to outdistance the spiritual ends for which you live. You have allowed your mentality to outrun your morality. You have allowed your civilization to outdistance your culture. Through your scientific genius you have made of the world a neighborhood, but through your moral and spiritual genius you have failed to make of it a brotherhood. So America, I would urge you to keep your moral advances abreast with your scientific advances. With so many forces these days itching for a fight, with so many seeing physical confrontation as an answer to today’s problems, with conflict seeming as inevitable as the sunrise, how can King’s words not resonate? So in the days ahead let us not sink into the quicksands of violence; rather let us stand on the high ground of love and non-injury. Don’t the daily battles leave you weary? The fury over this Facebook post, that toxic tweet, this snarky speech, that horrific article. King knew the feeling; he just chose a different path. He chose Jesus’ path. Can we not also “decide to stick to love”? But how? How can we stick with sticking to love? So I want to say to you, America, reach out! If you reach hard enough you will discover God’s grace. It is that grace that can lift you from the fatigue of despair to the buoyancy of hope. It is that grace that can lift you from the midnight of sorrow to the daybreak of joy. It is that grace helps you to see that by the grace of the Almighty God you can live in this world and you can live this life. You can see the face of Almighty God with all of his eternal principles. In the midst of man’s tragic sin stands God’s amazing grace. May divided America, on this holiday honoring his memory, heed the Reverend King’s words.